Auckland Botanic Gardens covers 64 hectares of land including 10 hectares of native forest. Development of the gardens began in 1973, and they were opened to the public in March 1982. The wide array of plant collections include a diversity of New Zealand native plants, African plants, edibles, perennials, annuals, magnolias, an arboretum and the Potter Children’s Garden. 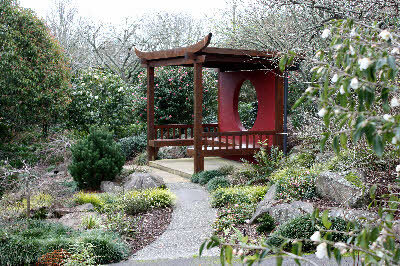 The Garden has a substantial horticultural Library open to the public, established by gifts, bequests, and an annual grant from the Friends of Auckland Botanic Gardens. The camellia section includes a copy of the Chinka Zufu - the Japanese Emperor's book of his camellia collection. Planting of the Auckland Botanic Gardens Camellia Garden commenced in 1987. Neville Haydon advised on the layout and content of the garden, and he was also the main supplier of plants. 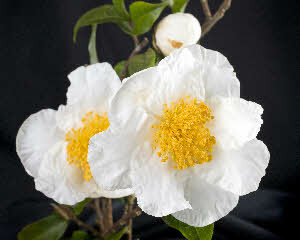 The aim was to establish comprehensive collections of species camellias and hybrids based on the small leaved species. Representative collections of japonicas and reticulatas were also planted. The main criterion for these collections was garden performance in Auckland conditions, with Neville Haydon advising on selection. A comprehensive collection of autumn flowering types (predominantly sasanquas) had already been established in the Shrub Trial garden, with the first major planting taking place in 1982, and a second planting in 1985. The intent of the Camellia collection is to demonstrate to visitors the versatility and beauty of this diverse genera, and to inspire ideas as to how they may be used in gardens. Currently Auckland Botanic Gardens Camellia collection contains 62 species and 487 cultivars. The main flowering period commences in autumn and continues until early summer. The diversity of foliage and form provides year round appeal. Planted amongst the camellias is a diversity of mainly Asian plants including trees, groundcovers and bulbs. Adjacent to the Camellia Garden is a large collection of magnolias that includes many hybrids developed in New Zealand. The camellias are comprehensively labelled, including an accession number to facilitate sourcing of background information. Several advisory leaflets on camellias are available from the visitor centre and also from the Botanic Gardens website. These advise on cultural practices and recommend those camellias that have proved most suitable for growing in Auckland.